The choice of an AWG 150 is often made by medium to large food processors who want to take full advantage of the range of applications with ActiWa®. 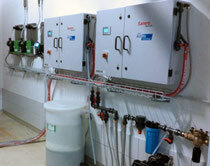 The use of a buffer tank compensates the fluctuating daily demand for ActiWa®. The full capacity of 24 hours can thus be used. In theory, more than 50 m³ of a disinfecting solution (diluted ActiWa®) per day are available for disinfecting applications in CIP processes. tap size (metric) 3/4l in.